Before he sold it and moved to DC to become an editor and eventually publisher, superstar artist Jim Lee's first stab at running his own comic book business came 25 years ago, when he introdued the WildStorm line of comics at Image Comics. Lee was one of the seven original Image founders, each with his own studio, and this week sees the return of a number of his earliest Image/WildStorm creations in the form of The Wild Storm #1, the first issue in a maxiseries to be written by Warren Ellis with art by John Davis-Hunt. Ellis's approach to The Wild Storm seems to be similar to what DC is doing with Rebirth, in the sense that it's a reboot, but one that retains most of the things fans love the most about the characters and concepts of the Wildstorm Universe. Many of those elements haven't been seen in years: the Wildstorm universe was already in sort of bad shape before it got collapsed into the post-Flashpoint DC Universe. None of the Wildstorm elements seemed to take hold with readers of The New 52, though, and it wasn't long before almost all traces of Lee's once-bestselling universe had been erased from the DCU. 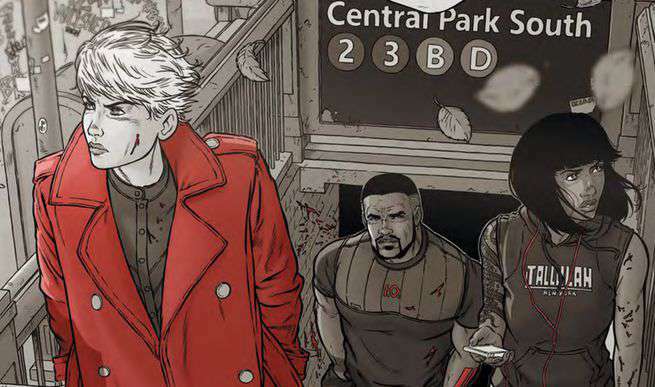 Now, taking advantage of DC's multiverse and a pop-up imprint like the one Gerard Way is curating in Young Animal, Ellis is bringing Wildstorm back -- more or less all at once and with a lot of stories in the characters' rear-view mirrors. "The world-building was all over the place," Ellis said during a recent DC All Access interview. "I had to sit down and write a f---ing cosmology for this project. Jim Lee made me invent 12,000 years of intergalactic history and I will never forgive him." During the run-up to the project, DC also provided ComicBook.com with a brief, five-question Q&A (one of which fans will recognize from a recent interview published between Ellis and editorial that was published in DC's comics last month). Before you get into The Wild Storm, if you haven't already greedily dug it out of your ComiXology account like Gollum looking for his Precious, read up on what Ellis had to say about the project. You can get a copy of The Wild Storm #1 at your local comic shop today, or order a digital copy now. I was abducted. Please help. I am sending this message out through an interview in the hope that Jim Lee won't see it and therefore won't give me the hose again. Honestly, I'd been thinking for months about my tendency to never look back and never return to old projects, and whether or not that's a good thing. And then I got the call from Jim about coming back to relaunch Wildstorm, and it seemed like the universe had decided that I needed to revisit my thinking. So we'll find out if this is a good thing or not in the very near future. Seriously. I'm in a bunker under a building in Burbank. Please help me. How is THE WILD STORM going to be different from your earlier critically acclaimed, best-selling work on STORM WATCH and THE AUTHORITY? Well, it's nigh on twenty years later. I knew I wanted to preserve the themes from the original work by Jim and his friends - their fascinations with conspiracy theories and black ops, for instance. But that meant looking at the conspiracy-theory landscape of today, so there was a lot of research on, for example, the current state of UFOlogy and the Extra-Terrestrial Hypothesis. I'm also taking a more novelistic approach. As you may or may not know, I've written a couple of novels in the last few years - Gun Machine and Normal, as well as a shorter item called Dead Pig Collector - and being a novelist has very much affected the way I think about story. I mean, if you've read Trees, you can probably kind of tell that. So I'm bringing that approach into The Wild Storm, which, for me, is a new angle on writing Wildstorm properties. STORMWATCH was an episodic procedural in a lot of ways, and AUTHORITY was a pure action comic, so I wanted to find a different way in, this time, and this is what I decided on. Every six issues is a short book, and The Wild Storm is a four-book series -- 24 issues/chapters. Why did you choose artist Jon Davis-Hunt? You could have picked anyone. What made him the right artist for this project? That clean line, its modern feeling, his attention to acting and body language as well as his attention to detail and environment. Kieron Gillen showed me his work, and my first reaction was, "That's the artist." And I was right, too. Do you need to have read any earlier stories to understand The Wild Storm? No. Not at all. I knew from the start that this would have to be a clean beginning, and we're all entering at the ground level. How are you approaching these characters differently than you did in the past? Well, some of them I don't think I ever wrote! Jacob Marlowe was in a few panels in a flashback sequence in Stormwatch. I never wrote Michael Cray at all. But I'm treating them all as brand new characters. I think that the new version of Jenny Sparks may surprise a few people.